The Scottish Highlands are rich in Saxifrages and ten species are to be found there. Some of them inhabit the lower slopes and valleys, while other are widespread on the mountains themselves; five species are more or less confined to the highest summits. They are the Purple Saxifrage (Saxifraga oppositifolia), which, although not confined to the highest regions, as it may be found at comparatively low altitudes, is very common on our higher mountains; the Tufted Saxifrage (S. caespitosa) only found near the summits of the highest mountains; the Drooping Mountain Saxifrage (S. cernua) a very rare species only found on the summit of Ben Lawers and now nearly extinct; the Alpine Brook Saxifrage (S. rivularis) found beside streams and springs near the summit of Ben Nevis, Ben Lawers and Lochnagar; and the Alpine Saxifrage (S. nivalis) found not uncommonly on the higher Scottish mountains. 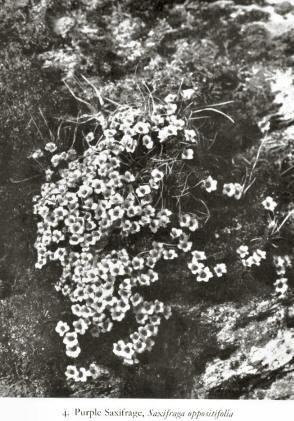 Of these Saxifrages, the first two are cushion-type alpines and the others are rosette types. While not as showy as many of the Swiss Saxifrages, our Alpine Saxifrages are very attractive and interesting plants. This is one of our most beautiful alpine flowers, and only those who have seen it in bloom in its natural surroundings can have any idea of how lovely it really is. Its large, purple blooms are to be found on the lower slopes among the melting snows in early April, at a time when colour is almost non-existent on the mountain sides. By May it is blooming wherever the snow has cleared on the highest peaks and corries. By mid-June its flowers have faded, and its seed is set and distributed long before the snows of early autumn have arrived. The Purple Saxifrage prefers most rocks and is found more especially on the northern and eastern corries and slopes, where the sun’s heat is much less and water is more abundant. Its long roots penetrate deeply into the cracks and crevices of the rocks, where they escape the hard winter frosts and are able to tap the water supply in the deeper soils. Above the ground is a short, tough stem, which is buried as far as possible in the soil. This stem give out slender branches, which creep along the rocks giving out other branches which are covered in tufts of leafy shoots. The whole system is very compact and seldom rises more than on inch above the soil The result of this compactness is the formation of dense cushion, which appears like a clump of green leaves, the branches being absolutely hidden by the closeness of the leaf tufts. The leaves themselves are evergreen, very small and shiny, and arranged in pairs, each pair being closely pressed to the one above. This helps us prevent undue transpiration. The leaves are interesting in having evolved a very ingenious device to check excessive transpiration. The leaves of plants are usually covered on the under surface by pores, known as stomata, by which the plant breathes, taking in oxygen and carbon dioxide which are used in the respiratory and photosynthetic processes. Through these stomata water escapes from the plant as vapour in the process of transpiration. To get rid of surplus water, some plants, especially those inhabiting wet places, possess special water pores of hydathodes at the tips of the leaves, or at the point of teeth along the margin. The Purple Saxifrage possesses such a hydathode at the apex of each leaf. To control the escape of water, this plant, in common with some other species of Saxifrage has a special mechanism. The tissue around the pore has the power of secreting chalk. Water leaving the leaf by this pore dissolves some chalk which is deposited on the surface of the pore. On dry days when evaporation is rapid, a heap of chalk accumulates quickly and soon closes the pore, preventing the exudation of any further water. At night, when evaporation is less, the escaping water dissolves some of the accumulates chalk and allows the water to exude again. The amazing thing is, that although this plant grows on rocks which contain little or no chalk, such as granite or gneiss, the roots by reason of special selectivity are able to obtain enough chalk to continually supply the chalk glands. Each leaf tuft sends up a short stalk surmounted by a beautiful, reddish purple flower, which is very large in comparison to the size of the plant often being nearly an inch in diameter. The individual flower is bell-shaped, the five petals being united for more than half their length. The flowers, being large and numerous almost hid the cushion thus making themselves very conspicuous to insect visitors, which, as in the case of the Moss Campion, are mainly butterflies whose long tongues alone can reach the nectarines at the base of the flower, and for whom it holds out its reddish-purple sign. Each flower contains ten stamens in two whorls. The ovary, at the base of which are found the nectarines, is surmounted by two styles. The stamens mature before the stigmas and a butterfly must visit the newly-opened flower to be dusted with pollen. On visiting an older flower the butterfly will leave some pollen on the now receptive stigma. Thus cross-fertilization is assured and an abundant supply of fertile seeds will be formed. This species, like the preceding, also forms a cushion, but it is only to be found at great heights and is much rarer. It cushions are not so compact and leaves are short and green and divided into two or three lobes. These leaves have no chalk glands as in Saxifraga oppositifolia. In this species the flowers are small and white, and one or two to each stalk. Each petal has a number of greenish veins running down toward the nectaries. These veins guide the butterflies and the flies which pollinate the flowers. The flower stalks are two to three inches high and are covered with a glandular down as in some lowland species. This acts as a barrier to crawling insects which would otherwise mount the short stalk and steal the nectar, without giving any benefit to the plant. To find this plant we must climb to the highest summits by way of the precipitous corries, where in the screes and rock clefts one may have the good fortune to find its small flowers. It is practically confined to the Cairngorm and Ben Nevis ranges. We now pass from the Cushion Saxifrages to those which belong to the Rosette group. In this series we again find the short main stem or stock buried as far as possible in the soil. Immediately from the top of this stock spread out compact rosettes of leaves pressed close to the surface of the soil. This rosette arrangement is very common among alpine plants. The leaves are arranged so that each one receives the maximum of light and are pressed close to the soil. This makes it impossible for another plant to grow within the radius of the leaves, an important factor where competition for space is severe. The lowness of the habit is very well adapted to the windy regions these plants inhabit. The flowering shoot is long and upright and surmounted by the bloom. This tall shoot protects the flowers from creeping insects and also makes the flowers very conspicuous. This is one of our rarest alpine plants, being confined to the broken schist formations near the summit of Ben Lawers, where it is becoming exceedingly rare and very seldom flowers. (S. granulata) of the Lowlands. The likeness between this plant and the Drooping Saxifrage has made some authorities think that it is but a starved mountain edition of the same plant. The bulbs are very easily detached and give rise to new plants. This method of propagation is known as vegetation reproduction and is common among alpine plants, being found in many widely differing families (Polygonum, Poa, Deschampsia, etc.). The stock is crowned by several radical leaves. These are on rather long, weak stalks and are kidney-shaped (reniform) with angular lobes and are almost glabrous on the upper surface. There are a few short hairs on the under surface. >From the midst of the leaves rises a fairly tall, flowering stem which droops slightly at the summit. There are a few small leaves on this stem and in their axils there are often small, brownish bulbils, which detachment, give rise to plants as in the case of the root bulbils. The flowering stem is crowned with one to three small flowers. These are white, and each petal has several well marked veins which converge on the nectary at the base and act as guides to insect visitors. The chief visitors are bees and small flies. Very often, however, the plant produces no flowers, relying on vegetative reproduction to continue the species. This is probably one reason for its increasing rarity and for the fact there is a great danger of the plant becoming totally extinct. Vegetative reproduction when not aided by cross-fertilized seeds must result in the gradual undermining of the race and its eventual extinction. Why this plant should be confined to Ben Lawers is impossible to explain. Perhaps it was a happy accident that deposited its seeds there in some distant past, who can tell? Some bird, perhaps, who after a lost flight from the Arctic regions landed on this high peak and left some seeds of the plant behind. Or, perhaps, its explanation can only be found way back in the Great Ice Age. This is only one of the many fascinating mysteries of the plant world, which will probably never be explained. To find this uncommon alpine, we must climb into the wild corries and risk our necks upon the cool, damp, north-eastern precipices of our highest mountains. We may find it very rarely on Braeriach and Cairn Toul, and more abundantly on the Ben Lawers and Ben Nevis Range. It may also be found in Skye. It possesses a very short stock which is of a hard, tough structure. The toothed leaves are arranged in a close rosette on the summit of the stock. They are of a leathery texture and obovate in form, tapering downwards to form a stalk. The thick leaves are well constituted to dry conditions, the fleshy tissues conserving water and the thick cuticle reducing transpiration. The flowering stems, which are from two to five inches in height, are erect and unbranched and are hairy in the upper part. It is usually naked, but sometimes bears one or two small leaves. The four to twelve fairly large, white flowers are collected together into a compact terminal head. The sepals are about the same length as the petals. Within the corolla are situated two whorls of five long and five short stamens and two styles. The flowers, which secrete nectar, are visited by small bees and flies. The long stamens move in towards the centre of the flower and, when they have shed their pollen, they recede their place being taken by the shorter ones. When all the pollen is shed and all danger of self-pollination has gone the two styles spread apart and become receptive. This is the mode of pollination inmost of the white and yell-flowered Saxifrages. This rare alpine is confined to the edges of brooks and springs near the summits of Ben Lawers and Ben More in Perthshire, of Cairn Toul and Lochnager, and perhaps one or two other summits of the Cairngorms, and of Ben Nevis and Aonach Mor. The short stock produces a few long-stalked, smooth leaves, which are three to five lobed and resemble those of Saxifraga cernua. The slender, flowering stems also possess several long-stalked leaves of simpler form, the upper ones forming a pair of bracts below the two or three flowers which are produced on short, slender pedicels. They are small, the calyx being as long as the corolla, and as they are not very conspicuous they are little visited by insects and are probably self-fertilized. Occasionally it produces bulbils in the axils of its lower leaves and these resemble those of S. cernua. Thus in the event of no flowers being formed in bad seasons, when the snows have lain late, the plant can propagate itself vegetative by their means.